Three of my friends and I took ten days to explore the east side of Australia including the world's oldest rainforest, Sydney, Great Barrier Reef, and beautiful beaches. In total, we visited six different cities/areas. Our planned itinerary for Australia was a mix of both outdoorsy and city adventures. 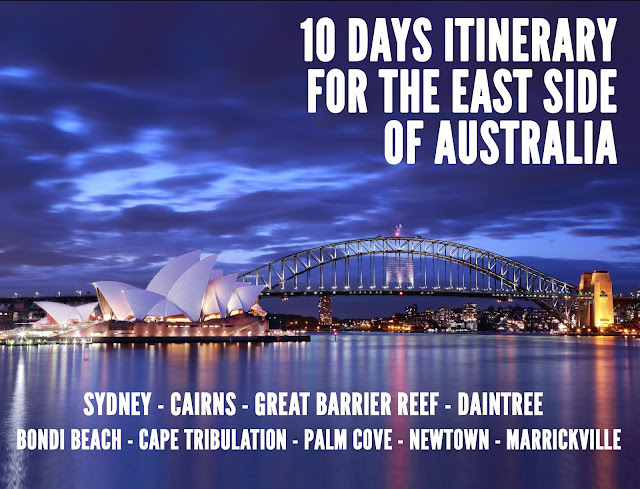 Below is a summary of our ten days planned itinerary in Australia. Australia has a number of different visas (length/purpose of visit/country eligibility), ETA subclass 601, eVisitor 651, and Visitor Visa 600. eVisitor is eligible for certain citizenships (U.S. citizens are not included). Visitor Visa is for if you want to stay longer than 3 months at a time. The last one is called the ETA.